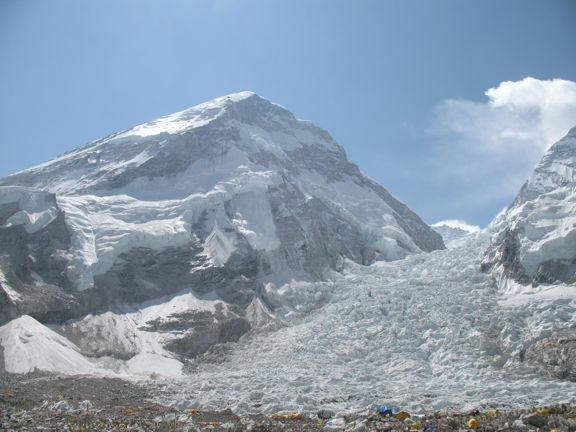 Keith Cowing: On Saturday afternoon, Scott and I were standing in the middle of IMG's Everest Base Camp taking pictures when a loud noise came from the Khumbu Icefall. It was an avalanche. There are dozens of avalanches every day here - and you get used to them after a while. But this one was different. Within a few seconds we were all looking at the avalanche. The sound was incredible. Luckily I had my camera - one capable of shooting video. I had it trained on the nascent avalanche within seconds and managed to catch the entire event. You can witness this event for yourself below. At first, all we saw was a large mass of snow coming off of the western wall overlooking the icefall. After several minutes much of the avalanche's energy had been transformed into an expanding, billowing cloud that covered the entire lower icefall. After 3 minutes we began to feel the spindrift on our faces - the fine ice particles that were produced by the utter pulverization of the falling snow and ice. After another minute, the cloud began to dissipate into nothingness. If it were not for that danger that such an event can offer, I'd have said that this is one of the most awesome, inspiring things I had ever seen. Instead, everyone's first thoughts were with anyone who might have been on the icefall at the time of the avalanche - either ascending or descending. We soon learned that no one was hurt or killed - but some of the ladders and fixed ropes were buried. For all its stunning beauty and allure, this is still a very dangerous place. Those who visit here - even if only to stay at Everest Base Camp - must use caution every day. Indeed, although our campsite was carefully chosen, I have already seen three large collapses within mere meters of my tent. That sort of thing happens when you live atop an active glacier. \n\nKeith Cowing: On Saturday afternoon, Scott and I were standing in the middle of IMG's Everest Base Camp taking pictures when a loud noise came from the Khumbu Icefall. It was an avalanche. There are dozens of avalanches every day here - and you get used to them after a while.